Daily Illuminator: The Only Thing Better Than A New Munchkin Mini-Expansion . 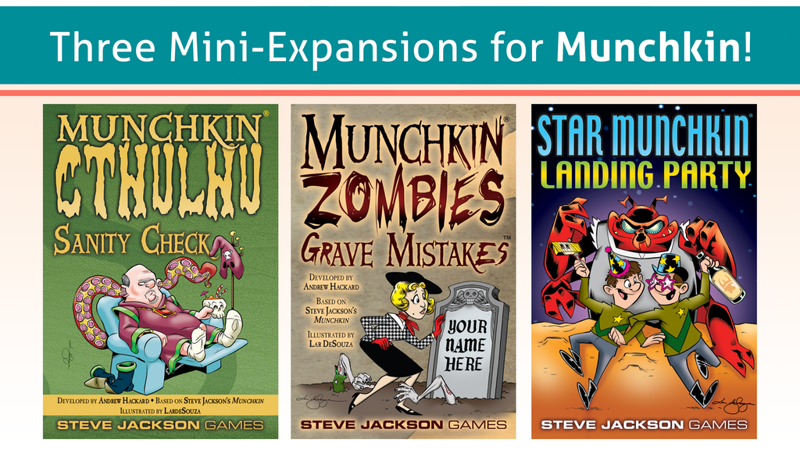 . .
March 26, 2019: The Only Thing Better Than A New Munchkin Mini-Expansion . . .
. . . is THREE new Munchkin mini-expansions! That's what you get in our newest Kickstarter, which has already passed the first few stretch goals and is well on its way to another huge success! Munchkin Cthulhu: Sanity Check, a bunch of new brain-breaking monsters and the Treasures you'll need to beat them! Star Munchkin: Landing Party, more cosmic fun for everyone whose names appear in the main credits . . . extras beware! Munchkin Zombies: Grave Mistakes, stylish accessories and hapless foes for the 21st-century zombie to feast upon! This is a fairly short campaign, ending on April 12, so definitely don't wait to back this!